The new SBS series “Switch: Change the World” depicts a petty conman serving justice to the corrupt rich by faking the role of a prosecutor. The aim of the program is to deal a cathartic blow to the world where true villains live in penthouses while petty criminals are put behind the bars. 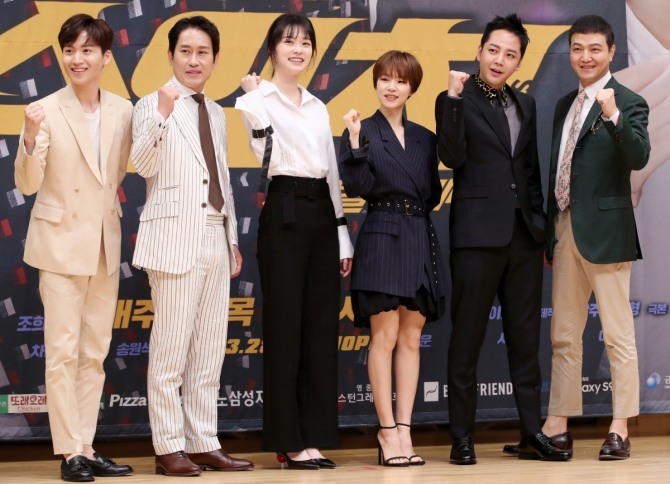 The satisfaction will be thrilling, promised director Nam Tae-jin, at the press conference for the show held at SBS headquarters in Mok-dong, Seoul, Wednesday, where he was joined by the main stars Jang Geun-suk, Han Ye-ri and Jung Woong-in, as well as supporting stars Jo Hee-bong, Shin Do-hyun and Ahn Seung-hwan. The story’s main protagonist is the swindler Sa Do-chan, who is a doppelganger look-alike of law-abiding prosecutor Baek Jun-su. When Baek falls unconscious following a premeditated car accident, Baek’s fellow prosecutor, played by Han Ye-ri, scouts Sa to step in as a double. Sa, a born natural crook and a genius, makes full use of his quick acumen in faking the role of Baek and ends up doing a better job of holding bad guys accountable than the real prosecutor. Actor and singer Jang Geun-suk plays the double role of Sa and Baek. Han Ye-ri plays the female lead and Jung Woong-in the villainous art dealer who amasses a fortune through the black market drug trade. “Switch” will be Jang’s last work before he commits the next two years to his national defense duty. The 32-episode series will premiere at 10 p.m. on Wednesday and will air every Wednesday and Thursday.